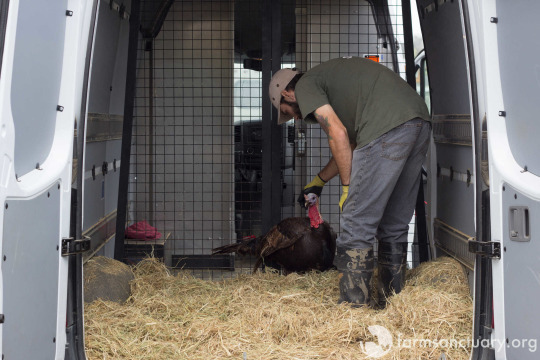 On a rainy Tuesday a few weeks back, we began our journey to help two amazing turkeys, Tofu and Tina, embark on a new life. 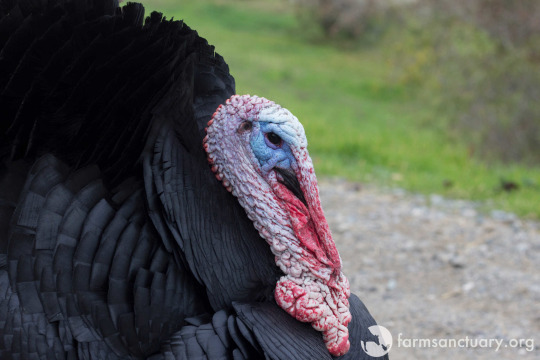 These beautiful boys (Tina having been named before he was discovered to be male) had been cared for and loved as companions for nearly their entire lives, but they’d found themselves in need of a new home when their guardians moved and were unable to take their turkey friends with them. 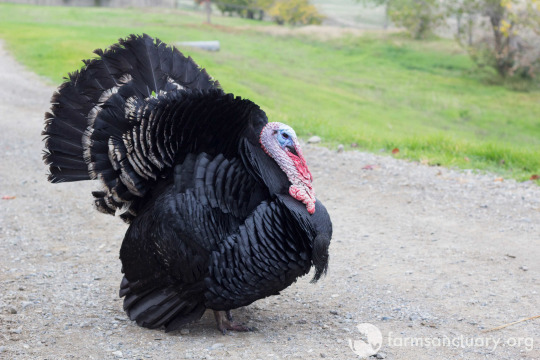 Tina strutting his stuff at our Northern California Shelter. 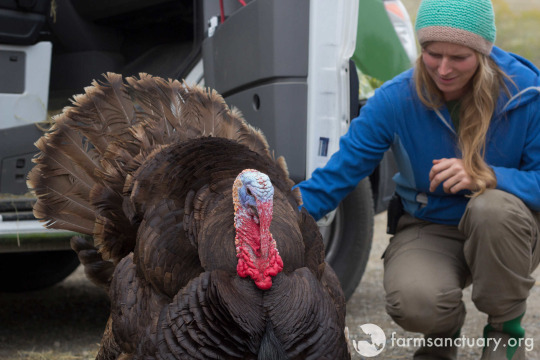 The family was heartbroken to say goodbye, but knew that with the help of Farm Sanctuary and our Farm Animal Adoption Network (FAAN), Tofu and Tina had a bright future ahead of them. 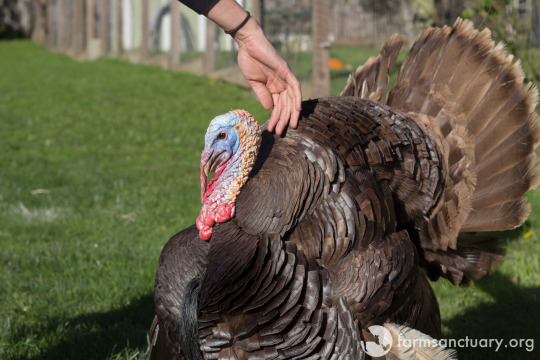 And they’d reach their wonderful new home just in time to celebrate a very happy, turkey-friendly Thanksgiving! Melody, the birds’ former guardian, carries Tofu to our sprinter vehicle. Melody places Tina in the sprinter. 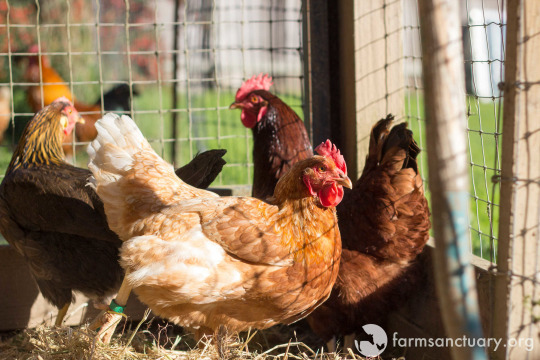 Tofu and Tina started life on a farm where they were being raised for meat. They were poults (the term for baby turkeys), so young that they were still in an incubator, when the incubator caught fire. All the other poults perished, but somehow Tofu and Tina survived. 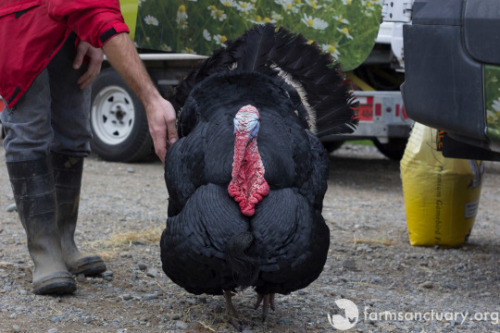 After this horrific event, the farmer decided to stop raising turkeys for meat, but he was not interested in caring for the two young survivors — which is when their first family stepped in and offered to take Tofu and Tina and raise them as part of the family. Dean making sure Tofu is comfortable in the sprinter. 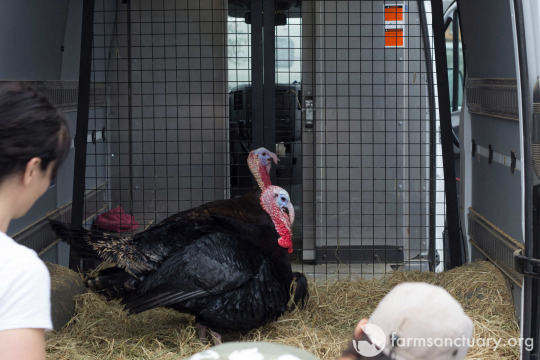 Tina and Tofu ready to make the trip to Farm Sanctuary in Orland, CA. We were able to easily load these two charismatic boys into our sprinter, and soon they were on their way to our Northern California Shelter. 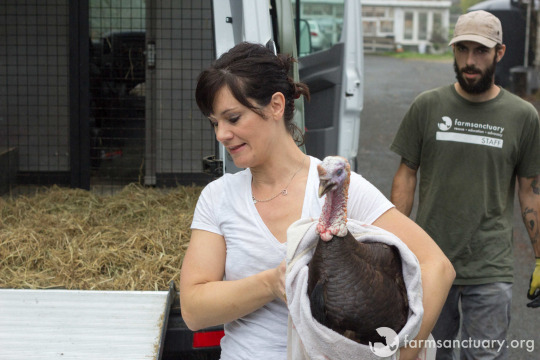 Tofu arrives at Farm Sanctuary, where he’s greeted by staffer Elise. 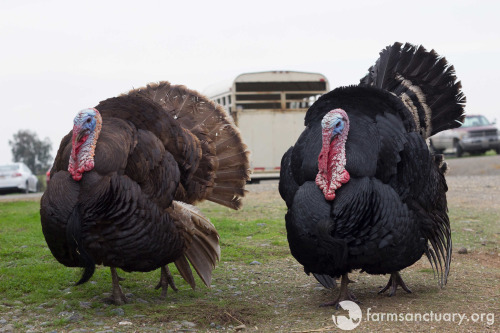 Strutting their stuff: Tofu and Tina weren’t afraid to show off once they arrived at our Northern California Shelter. 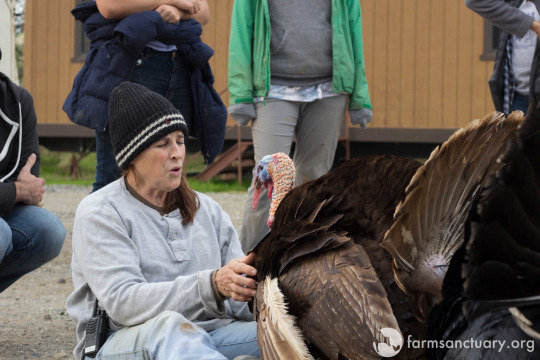 They loved all the attention they received from shelter staff members and volunteers, and would wear themselves out strutting around the sanctuary. 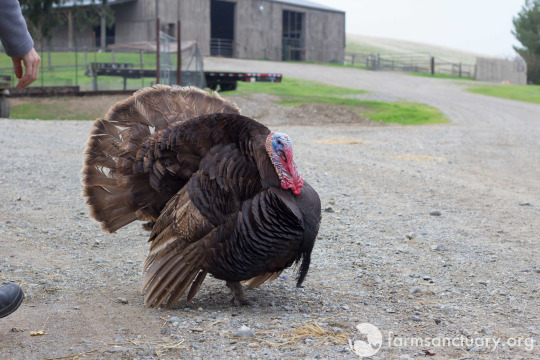 Tina strutting his stuff for the whole sanctuary to see. 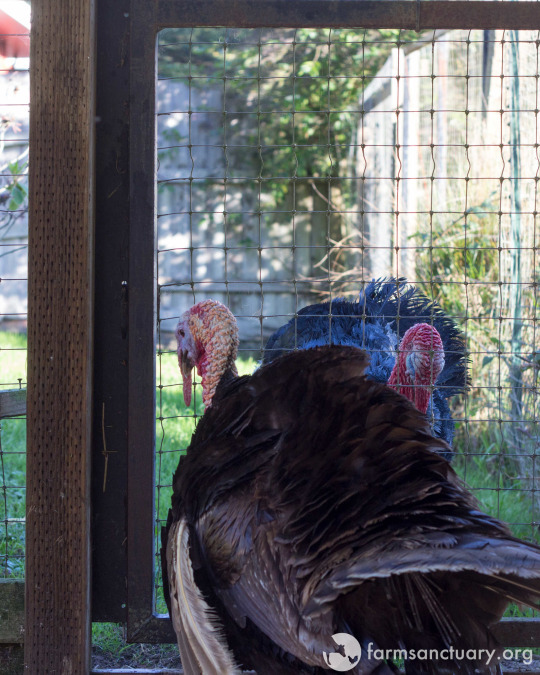 Call of the wild: These two wild boys weren’t shy about making some noise once at the sanctuary! In addition to all the strutting they did, they also showed off with their gobbling, often chatting up anyone who walked by. Soon enough, we were on the road again, as Willie Nelson says. 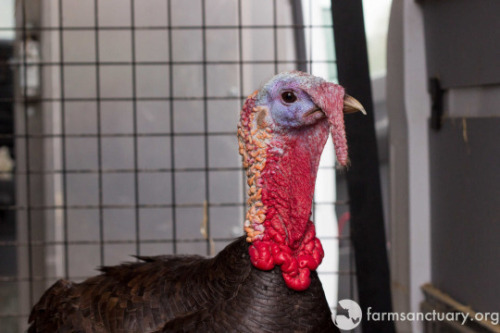 Before long, it was time to bid farewell to these two amazing turkeys so they could make their way to their forever home. 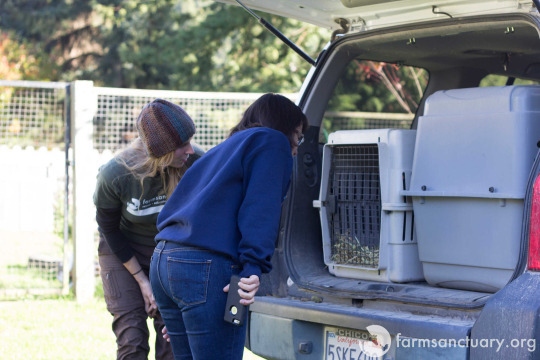 We gently loaded Tofu and Tina into the sprinter again, along with seven chickens who were being adopted along with them: Arlene, Ruby, Solace, Timna, Aquarius, Shira, and Aviva. Soon, they were on the way to the home of their amazing new “mom,” Tamara. 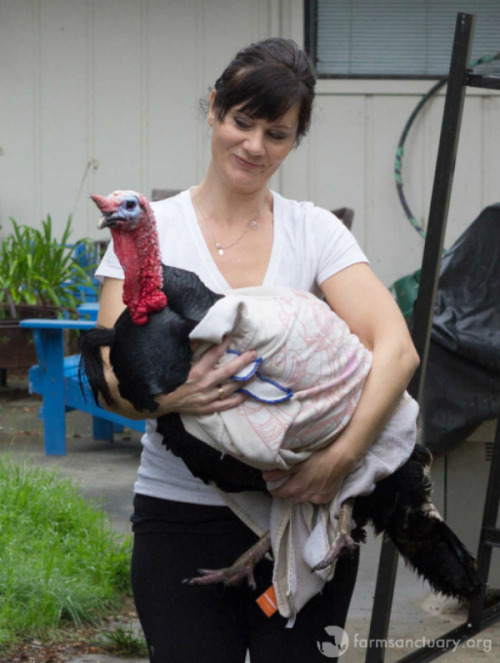 Shelter staffer Elise introduces adopter Tamara to her new turkey and chicken friends. Only a few short hours later, the boys and their chicken buddies found themselves at their new home. Here, they will forever be loved, cared for, and seen as the unique individuals they are. 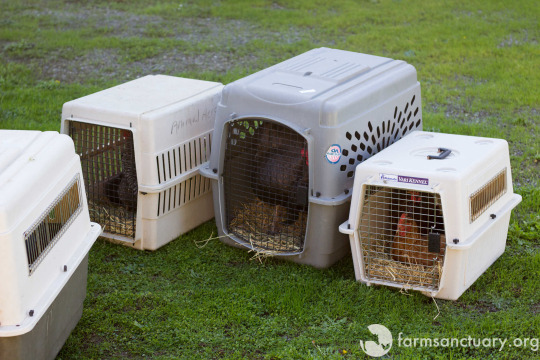 The birds in their crates after being unloaded from the sprinter. They were all very ready to start investigating their new home! The chickens getting used to their new digs. 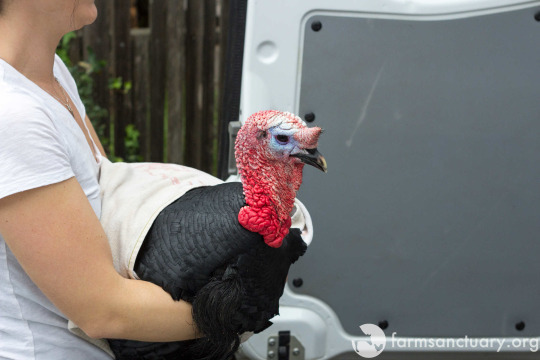 Tofu being led to his new backyard home filled with grass and sunshine — what more could a turkey ask for? Tofu and Tina investigating their new home from all sides. From tiny poults who survived a tragic accident to the beautiful and boisterous boys they are now, Tofu and Tina have truly defied the odds. We know they will continue to thrive and be loved for life in their new home! Tina and his buddy Tofu beat the odds and are safe for life! 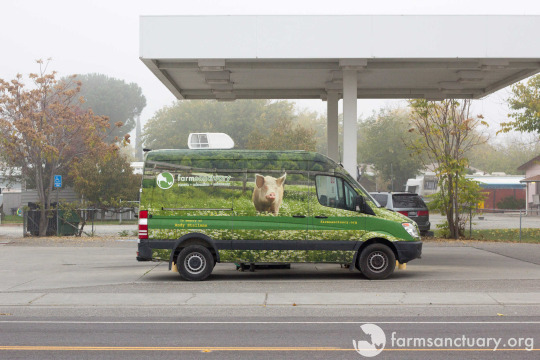 If you’re interested in providing a loving forever home to farm animals in need and have the time, resources, and farm-animal-friendly zoning needed to properly care for these amazing beings, we hope you’ll consider joining our Farm Animal Adoption Network (FAAN)! 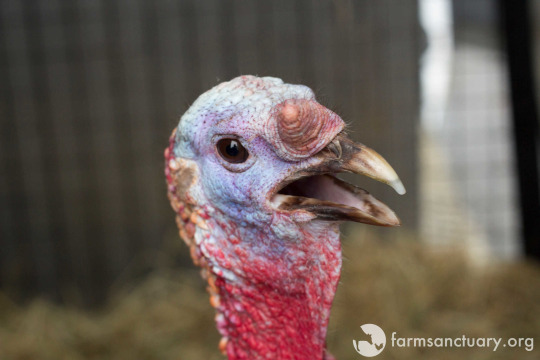 Learn more about farm animal adoption here, find out about farm animal care here, and read the stories of FAAN members and their farm-animal family members here.